Growth is the result of a well-defined plan combined with creativity, hard work and focused implementation. The right message delivered to the right audience through the right channels will ensure that every aspect of your program succeeds. After all, helping our customers grow their business through communication is what Perfect is all about. Under our roof are all of the tools you need to execute the proper communication mix. There are many choices to consider when delivering your message to your audience. One tool simply doesn’t make sense. 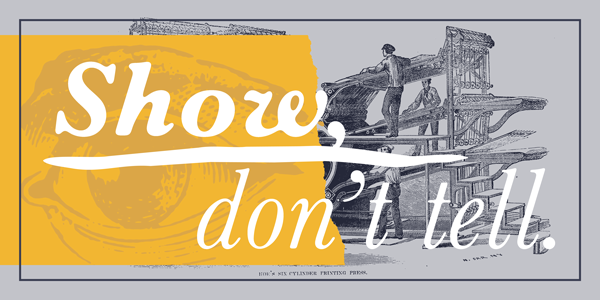 “Show, don’t tell” is a maxim for writers that goes all the way back to elementary school English class. Executed at the right time, showing, or placing the reader in the moment through the use of descriptive text and detail, can make a much more dramatic sensory connection than using boring exposition (or telling) to relay events and action. This adage holds true for marketing with print too. For this reason, if you’re investing the money to print promotional materials, you should leverage the physical properties of print to “show” who you are. You shouldn’t just print basic pieces and load them with copy in an attempt to “tell” who you are. Do you want to promote yourself as a premium brand? Show it, don’t talk about it. Do you want to convince your audience that your offering has a lot of value? Exhibit it, don’t say it. Do you want the recipient to know how creatively you think? Display it, don’t describe it. Indeed, print’s tactile qualities provide marketers with a fantastic opportunity to make a sensory connection with their audience by taking advantage of our innate predisposition to touch. Research shows that we connect more emotionally with items we can touch, like printed marketing materials. Additionally, communications that take advantage of touch perform better than other types of communication when it comes to message recall. It seems the more senses we can engage when communicating, the longer the recipient’s recall will be. If you want to make a longer-lasting impression on your audience and connect with them emotionally, fully leverage the physical properties of print. Combine elements like paper, coatings and finishing techniques to produce marketing materials that match the value of your brand and the offer you’re making. Today more than ever, you have to deliver your message in a creative, memorable way to connect with your audience. Consider some of the elements below to improve the impact of your printed promotional materials. Paper is the starting point. Your choice will serve as the foundation for any impression you’re trying to make with your printed piece. Paper is the main way your piece will engage the sense of touch. Actually, the paper you pick can make a statement by itself. The type, weight and finish will dictate how the paper handles—how it folds, how pages turn, how the reader interacts with it. Specialty options like metallic, textured and translucent can add another level of feel and improve the impact of your piece. The right paper choice is critical if you want to accurately portray your brand value. Coatings are an ideal way to increase the perceived value of your printed materials. With enhanced color, high gloss and improved feel, coated materials can help express a high-value, premium image. The common types of coating available for print are varnish, aqueous and UV. Although each brings its own pros and cons, UV can provide more special effects such as scents, glitter, rough touch and raised surfaces that add depth. When combined with the right paper choice and coating, finishing techniques like embossing, foil stamping and die cutting can use the physical properties of print to deliver a tremendous impact. These techniques create depth, change shape, add dimension and add a little fun. Whether it is highlighting elements within a piece or creating a unique format, finishing can increase interactivity and persuade the recipient to handle the piece longer, which will promote recall and connection. With more than 30 years in the printing industry, we know a few things about what print buyers want. Most importantly, they want to work with a trustworthy partner. After that, when it comes to project delivery, they want speed, quality and no surprises. Every once in a while, however, some project seems just a little harder to deliver than others. We’ve thought about this a lot through the years, trying to determine the keys to successfully delivering projects on time and without surprises. What we’ve determined isn’t necessarily earth-shattering, but it is important nonetheless: you must have good print specs. Yes, the key to successful project delivery is having complete project details from as early in the production process as possible. As a matter of fact, they should exist right from the start. Printing is a complicated process. There are lots of details involved and many variables at each stage of production. Miss one small detail and the final product can end up nothing like what was intended. To help reduce the potential for unintended results, basic project details need to be outlined and understood by both the client and the printer right from the start. Establishing accurate print specs at the beginning of the process can create this mutual understanding. Print specs are the primary way a client can convey what they envision for their final product. The more complete the specifications, the better the printer can understand the client’s vision. With a clear vision, the printer can provide a more accurate cost estimate, make time-saving or cost-saving suggestions, and ensure they deliver a high-quality product in an acceptable timeframe. 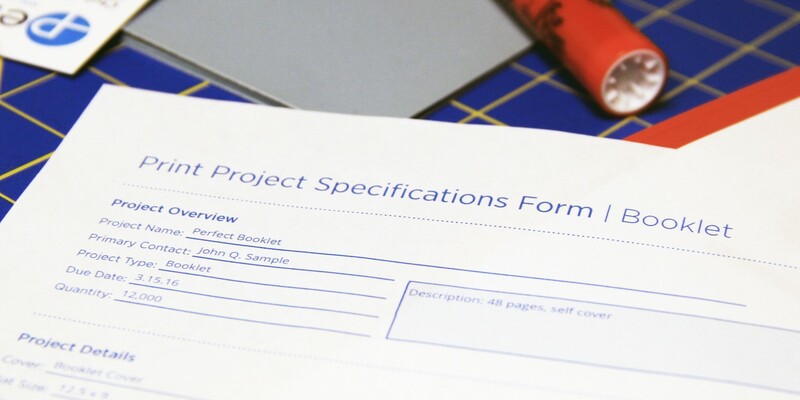 We’ve created a project specification form to help our customers outline their specifications so we can understand their project vision. The form has two pages. You can use the first page for any project; you can use the second page for booklets, which have a cover and inside pages. Feel free to use the form to organize the specifications for your next project. I recently had the pleasure of traveling to Atlanta to attend the SGIA Expo, which is the Specialty Graphic Imaging Association’s annual event. Like most trade shows, the expo brings together vendors, printers, manufacturers and other industry professionals to see new equipment and discuss trends. In the case of SGIA, the focus is the digital and screen printing of large format and soft materials. We’re talking point-of-sale signs, trade show displays, textiles, banners, window displays, vehicle wraps, floor and wall graphics. You name the material and they’re probably printing on it. This was my first time attending the expo. Much of what I saw was new and eye-opening. But there, among the 23,000 attendees, new product lines and educational sessions lurked a familiar friend: digital technology. It is not an overstatement to say digital technology has thoroughly disrupted the commercial printing industry. In fact, advances in digital printing are slowly eroding many of the traditional printing processes, like offset, that have forever been the foundation of our industry. Most, if not all, large commercial printers have become hybrid shops, using both traditional and digital technologies to deliver print services. Perfect has been a hybrid shop for almost 10 years now. Although not much of a surprise when I think about it after the fact, I was impressed, and in some awe, to see how digital technology has disrupted the specialty graphics industry. The SGIA expo used to be the domain of screen printers. Screen printing is the “analog” technology of the specialty industry. With the impact of digital, the event has grown tremendously. It is now a much more diverse community. Richard Romano, industry analyst and author, says today’s large format specialty graphics industry consists of companies that moved into it from other places. You see this reflected in the numbers. According to the SGIA 2015 Industry Survey, just 2% of specialty printers consider themselves to be “analog only,” or screen printers. About 40% of the survey’s respondents are “digital only” printers. Around 30% consider themselves to be multi-technology shops, using both analog and digital printing. Just like in commercial printing, digital technology has brought cost-effective, good-quality short run opportunities to the specialty industry. Digital still is not the best at color matching, and it does not handle specialty inks like metallics well. But it has improved quickly. Specifically, speed, image quality, color reproduction and consistency have all gotten better in digital specialty printing. This has given clients the opportunity to use large format and soft materials that were once only available to large companies that could afford large runs. Today, it is possible to cost-effectively print just one building wrap, or wall graphic or window display. This is great news for smaller companies who want to express their brand in ways that were too expensive. This is an opportunity for commercial printers who are familiar with the digital processes to consider new specialty graphics services. We’ve done large format printing on rigid and roll-fed materials for a few years now. What is potentially up next for us is figuring out how we can provide digital printing on soft materials. As advancement in digital technology knocks down even more barriers, additional specialty graphics opportunities will open up for commercial printers. It’s funny what you can learn bumping into an old acquaintance unexpectedly. The dreaded error list. For any print project going through file prep, it means a delay in progress. Missing fonts, low-res images—no matter the error, it takes time to troubleshoot. As a result, turnaround gets extended. Extra time is not the troubling part of fixing file prep errors. It’s the knowledge that the delay was probably avoidable. A little more attention to detail during file prep and the project could sail right through preflight. We’ve developed a checklist of suggestions to help our customers prepare files that will speed through prepress. 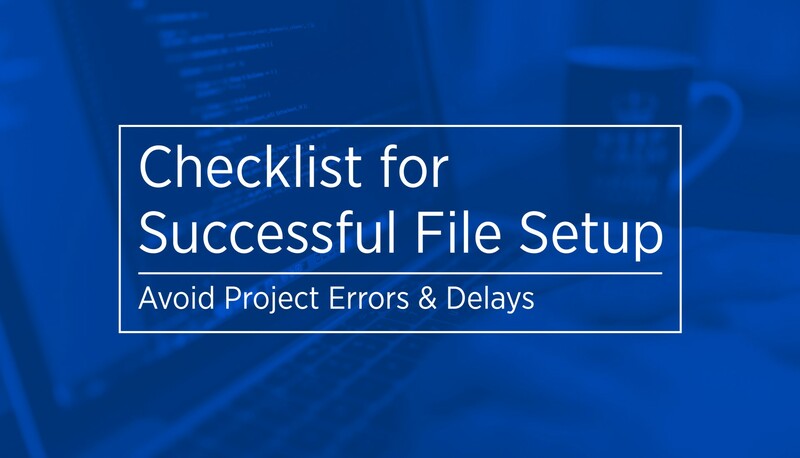 The list includes tips for initial document set up, tips to keep in mind while designing your project, and to-dos for when you’re preparing your file for submission. To say the print industry has been going through change would be a huge understatement. 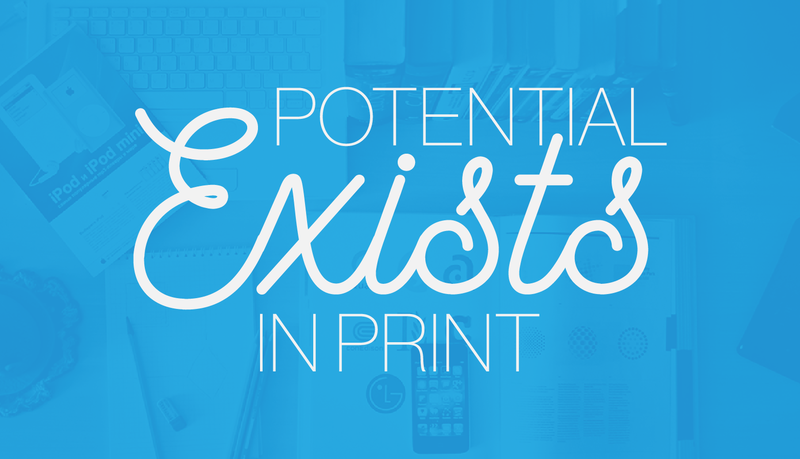 With the impact of digital media, the commercial printing industry has been altered forever during the last decade. There has been significant consolidation. Some forms of print communication have disappeared or have been relegated to postscript status. Emerging print technologies have recast the roles of former principal players and marginalized once-essential production approaches. It has been a challenge for the industry to even come close to its pace of growth from 20 years ago. Based on what I saw and heard during my recent trip to the 2015 Graph Expo trade show, however, those in the print industry who made it through this transition are entering a period of potential growth. The Graph Expo is an annual event where manufacturers and suppliers from across the graphics industry gather to show off their newest products and services to businesses and graphics professionals. At the Expo, I usually see the most recent print production technologies and I hear industry leaders discuss where we’re headed. This year certainly was no exception. Growth in Segments – One interesting educational session I attended was “The Status and Future of the Printing Industry,” given by Frank Romano, a professor emeritus at the Rochester Institute of Technology College of Imaging Arts and Sciences. In his session, Frank provided some perspective on the transition print has gone through. Although experiencing rapid, permanent change, print still is a relevant part of today’s multichannel communications environment. The print industry certainly is smaller than its high point 20 years ago. However, the rate of consolidation has leveled off. There are now segments within the industry that are growing again, such as direct mail, promotional printing and large-format signage. This growth is supported by evolving technologies, many of which were on display at the Expo. Digital Moving into Finishing – Coming as no surprise, digital printing was one of the most prevalent topics at the Expo. Inkjet and toner presses continue to advance, both in their ability to deliver higher quality and in the size and type of substrates they can handle. For me, the most interesting advancement in digital technology is occurring in finishing. In the not-too-distant future, finishing techniques such as foil stamping, embossing and diecutting will no longer require dies. Printers will create these special effects directly from digital files. The fixed cost of a die and the lengthy setup process have made these effects cost prohibitive for small runs. Digital finishing opens up new opportunities for visual designers. Special effects produced in the digital workflow will make smaller runs affordable. Print Supports Digital Media – One reason growth is occurring in areas like promotional materials and signage is the ability of these types of print to complement digital communications. They allow for personalization as well as the opportunity to link to digital media. Armed with capabilities like these, communicators can differentiate their messages and reach audience segments in conjunction with digital media. Future trends point to an ability to print on a growing variety of unique substrates. This will aid in differentiation. Direct mail is a proven way to get responses. According to the Direct Marketing Association’s 2015 Response Rate report, direct mail actually outperformed digital channels. The DMA report indicated direct mail achieved a 3.7% response rate while all digital channels combined got a 0.62% response. The number of direct mail projects we do at Perfect supports the notion that it still works. We print and mail a lot of direct mail for our clients. We produce high-value dimensional mailers, discount-offering postcards, and the tried-and-true direct mail fundraising letter. Recently, we held a call with a customer looking for ways to impact response for an upcoming letter campaign. To their credit, the customer had already uncovered a good bit of insight by testing previous mailings. They tested messaging, format and size. They discovered that a large envelope (9 x 13) with handwritten addresses got the best results. Better than regular #10 envelopes and better than postcards. Envelopes at 9 x 13 can be costly, however, and writing addresses by hand doesn’t scale for large mailings. So the client wanted to discuss other factors that could improve response. Since their testing had included messaging and calls to action, we focused on other potential envelope features. Size – Our customer’s test results with 9 x 13 envelopes were in line with data from the DMA response report, which indicated oversized envelopes get a better response. According to the report, oversized envelopes have the best response rate at 5.0%, followed by postcards (4.25%), dimensional (4.0%), catalogs (3.9%) and letter-sized envelopes (3.5%). Their concern about cost, however, is a common one. That’s why we recommend an in-between option: 6 x 9 envelopes. They are larger than the typical #10, but they get mailed at a letter rate, which doesn’t increase postage costs. Color – Although a potentially costly option, using color envelopes can gain attention and increase response. Color envelopes stand out against much of the mail in a person’s mailbox. Color offers the chance to present a unique and creative brand image. Font – Although writing addresses by hand is definitely not an option for large mailings, there are plenty of script fonts available that mimic handwriting. Although obviously not authentic, they are a way to leverage the success handwriting seems to have on response while maintaining scalability. Stock – Stock choice is an underused technique to increase response. Using a textured envelope can increase response by engaging the recipient’s sense of touch. Texture often provides a subliminal impact that causes the recipient to interact further with a piece, usually resulting in them opening the envelope. Yes, inkjet is gaining ground. According to Smither Pira, inkjet will overtake toner as the primary digital printing process by 2019. Advances in inkjet technology are making it suitable for more and more commercial digital printing applications. 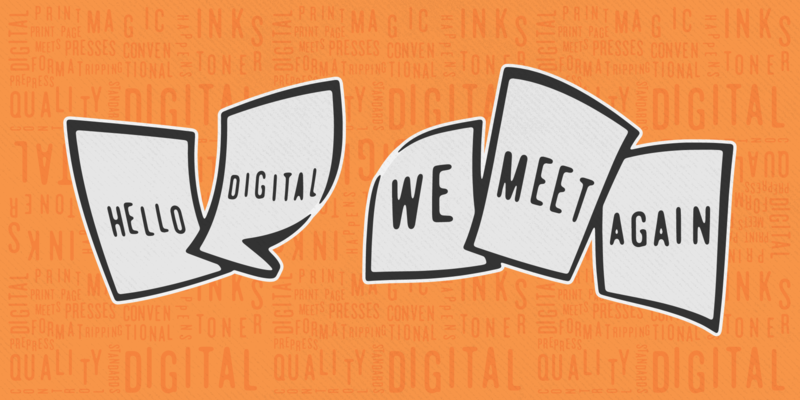 Inkjet already is the process of choice in high-volume digital printing and book printing. But several factors are keeping it from reaching its full potential in the broader commercial printing market. This was confirmed for me during my recent attendance at Dscoop, or the “Digital Solutions Cooperative.” Dscoop is a community of users of HP’s graphic arts technology. HP currently owns majority share in the digital press market with its Indigo presses. Dscoop is a significant source of information to predict how and when future printing technologies will be deployed. While HP supports the conference, the users group is independent of HP; its focus is helping members share knowledge to stay abreast of movements in digital printing so they can successfully manage their businesses. Not only does my attendance at Dscoop allow me to see cutting-edge print and finishing technologies, it gives me the opportunity to chat with other attendees about printing business trends. Based on my talks with fellow attendees, and on the equipment demonstrations I saw while at Dscoop, I believe the more mature toner process will continue to be the leader in the commercial digital print market for at least a few more years. Inkjet presses still need a little more time before they will be able to provide the quality necessary for commercial printing and fulfill the promise of faster production speeds and lower consumable costs. Coverage – Toner printers consistently produce medium-to-heavy areas of coverage better than inkjet. Inkjet’s quality has not yet reached a level acceptable to the graphic designers, print production personnel and marketing professionals who purchase most commercial printing. Substrate Variety – Toner can be used on a wider variety of substrates than inkjet at this point. While no production process can print on every substrate, there is a limit in the types of paper available for use with inkjet. Many papers used for inkjet require a special coating to treat the stock prior to printing. Advanced Finishing – Toner equipment manufacturers have enhanced their presses to provide digital finishing processes. Both Kodak and HP have digital presses that offer dimensional (raised) printing, while the HP Indigo can produce an embossed effect in line. Cost – Inkjet press costs make it hard to have a profitable business model in the short-to-medium run market. Toner presses still allow printers to have a more cost-effective model at this time. Drupa 2016 is the next watershed moment for inkjet printing. Drupa, the world’s largest graphic arts tradeshow, is where vendors traditionally debut new technology. I expect to see lots of news and announcements about inkjet at Drupa. Funny enough, the last Drupa, held in 2012, was billed as the “Inkjet Drupa” as inkjet was supposed to emerge from Drupa and take over the commercial digital printing market. While the 2016 Drupa will undoubtedly feature significant improvements in inkjet technology, the question remains whether these improvements will be enough to make it more widely accepted in the short-to-medium run market.